Before I talk about this weekend’s race at Pocono, I’d like to express my condolences to the Unser family. Shelley Unser, former wife of Al Unser, Jr., passed away unexpectedly yesterday. With her work with CARA in the nineties, and her relentless work in starting the Cody’s First Step Foundation when their daughter, Cody, was stricken with transverse myelitis at the age of twelve – Shelley Unser touched many lives. She will be missed. As I type this, I am not a happy man. For the past two years, I have attended the ABC Supply 500 at Pocono Raceway in person. My friend Paul Dalbey and I have made this our “guy’s trip” for the past two seasons and left our spouses behind. Both trips have been fun and memorable. Susan wants to go at some point because she’s heard me talk about how much fun I have on this trip. But it’s not going to be this year. I’ve referenced the job change I had to make last fall. My position was outsourced to another employer. I sit in the same office with the same phone number doing essentially the same job, with a few expanded duties. The good news is that I got a nice bump in pay. The bad news? Well, two things. First of all, my retirement with my previous employer got blown up. That will affect me in years to come. The more immediate effect is that I lost all of my vacation time. I had five weeks of vacation time built up with my previous employer. That’s now gone. I had planned on taking off the entire week of Indianapolis 500 practice and staying up there this past May. Those plans were scuttled with the job change. When Susan and I decided to go to Sonoma next month and spend a few days after the race, something had to give. That something was Pocono. In order to drive to Pocono from Nashville, I needed two days of vacation time – I only had one. With an expensive trip to Sonoma looming next month, along with next week’s trip to Gateway, I couldn’t afford to fly and rent a car. So I am begrudgingly sitting out Pocono this year. I’ll admit that now that the weekend is here, it’s tougher to sit this one out than I thought it would be. 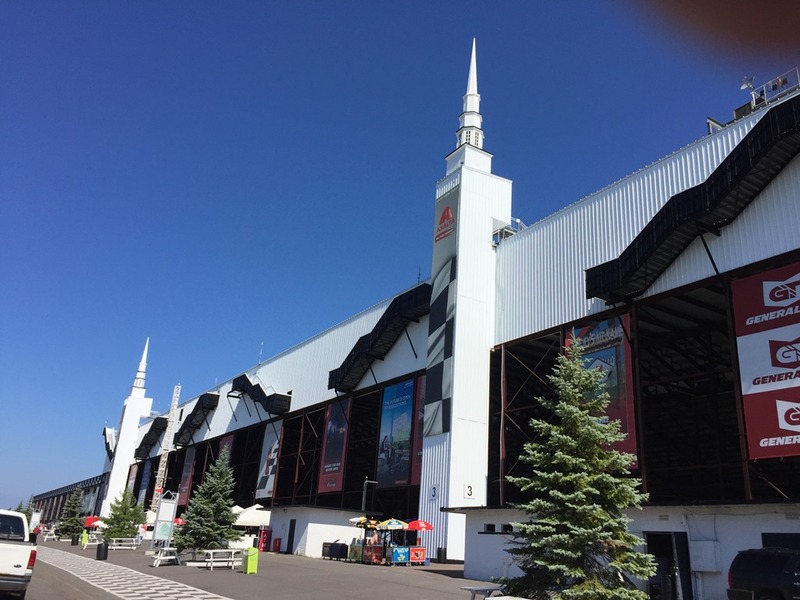 Pocono Raceway is another one of those quaint race tracks with charm. It’s not one of the cookie-cutter tracks built in the nineties and owned by one of the speedway conglomerates. It is a unique track, with a unique shape, owned by a unique family and located in a unique part of the country. Can I over-emphasize that Pocono Raceway is unique? If you are going to compare Pocono Raceway to the Indianapolis Motor Speedway, you’re missing the boat. A better comparison would be Road America and Watkins Glen, with a little bit of Churchill Downs thrown in. I’ve never been to Watkins Glen, but I get the sense that the Poconos of eastern Pennsylvania and the Finger Lakes region of upstate New York are quite similar. The tracks also seem to have the same type of old-school charm. The grounds at Pocono also remind me of Road America. The different structures around the facilities are unassuming buildings with white siding, although Road America has done a better job of updating their facilities. Pocono is like stepping into a time warp. For example, what other track has a lounge for driver’s wives? Pocono does. It is now used mostly as a VIP lounge – and that’s a very loose interpretation since they let me go in there – but they do still have a sign on the door that says Driver’s Wives Lounge. Its décor is best described as an early seventies funeral home motif. Why did I mention Churchill Downs? Because of the twin-spires at the top of the main grandstands along the main straightaway. They certainly add to the distinction and charm of the facility. The entire area of the Poconos is beautiful – and unique. The mountainous scenery is gorgeous and there are some outstanding restaurants in the area. Interspersed throughout the area are the infamous and tacky honeymoon motels, some of which are on the way to the track. The road from I-80 to Pocono Raceway is a winding narrow two-lane road that meanders slowly through the thick forest. Suddenly out of nowhere, a clearing appears with a giant race track sitting in the middle of it. Of course the race track is where all of the action will take place this weekend, well…there and the honeymoon motels. The two and a half mile triangle-shaped oval is one of the most unique tracks in all of motorsports. Not only is it wide enough on the straightaway for Indy cars to be six or even seven wide, but each of the three turns is unique and modeled after famous tracks. Turn One is roughly a 140° turn with fourteen degrees of banking and was modeled after the old Trenton Speedway. Turn Two, also known as the Tunnel Turn because it crosses the access tunnels into the track, is a 90° turn with nine degrees of banking and resembles the turns at Indianapolis. The third and final turn of the ‘Tricky Triangle” is only six degrees of banking and is similar to the turns at Milwaukee. Pocono Raceway presents a unique challenge to the drivers, but most of the drivers seem to love the layout. It’s obviously fast down the straightaways, but the turns can be, well…tricky. In Simon Pagenaud’s championship season of 2016, he finished every race but one – Pocono. It was on Lap 158 that Pagenaud discovered how difficult navigating Turn One at Pocono Raceway can be. He never made it to Turn Two. 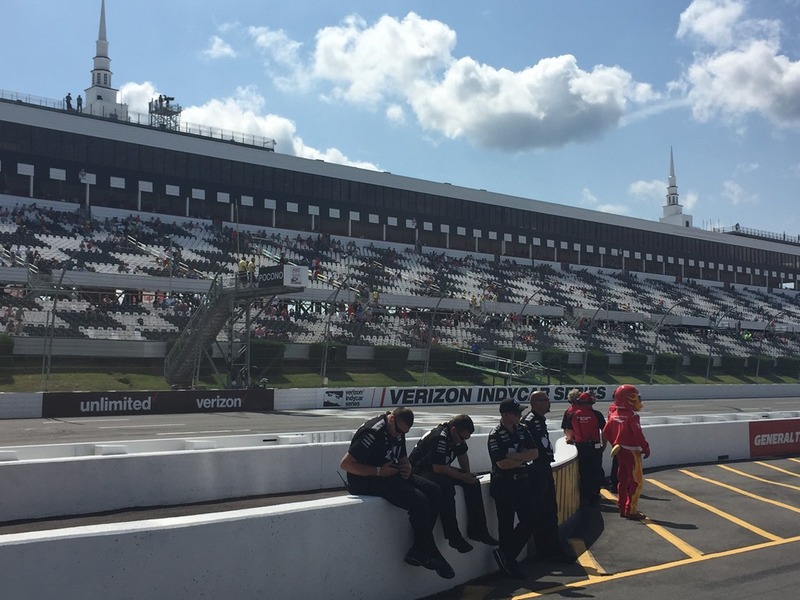 Legendary IndyCar names have won at Pocono – a track that was designed and built for Indy cars. There are no pretenders or surprise winners that have taken the checkered flag at Pocono. 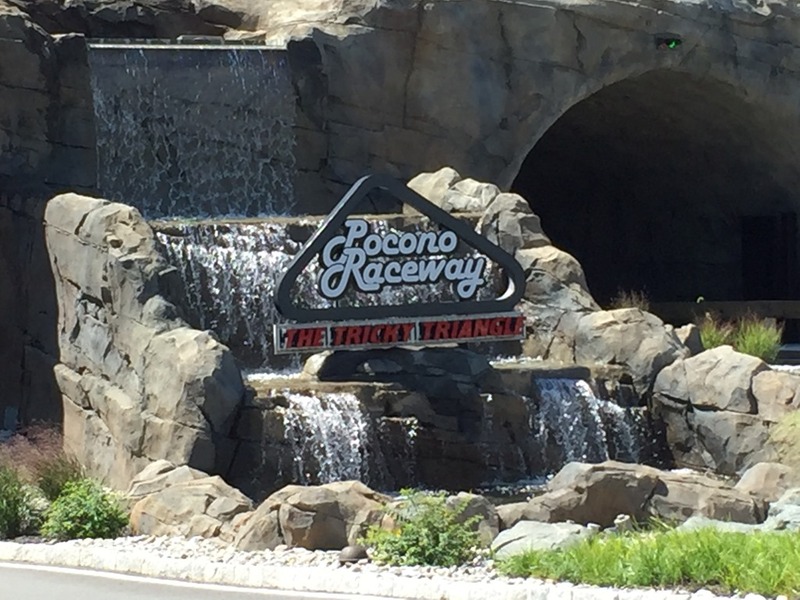 The names who have won at Pocono reads like a Who’s Who – AJ Foyt, Mario Andretti, Bobby Unser, Al Unser, Johnny Rutherford, Rick Mears, Bobby Rahal, Danny Sullivan, Scott Dixon, Juan Montoya, Ryan Hunter-Reay and Will Power are just some of the names that have won at Pocono. In fact, throughout all three iteration of American Open-Wheel Racing (USAC, CART, IndyCar) of all the different drivers that won at Pocono, only two did not win a series championship – Mark Donohue (1971) and Teo Fabi (1983). With Alonso-mania in full stride this week, it’s easy to forget that there is an important race this weekend. but there is, and the word "important" understates the ABC Supply 500 at Pocono Raceway this weekend. We are now entering the final stretch toward crowning a new series champion. Going into the weekend, Scott Dixon has a forty-six point lead over Alexander Rossi with Josef Newgarden just fourteen points behind Rossi. Although Will Power and Ryan Hunter-Reay are still technically in the mix – I think that the championship will go to one of the top-three drivers. Winning at Pocono could help cement it for Dixon, or make things very interesting for Rossi or Newgarden. So who do I pick to win this weekend? Usually, my picking a driver to win has the same effect as putting a curse on them. Many times they finish last. Will Power has won this race for the past two years and also won the Indianapolis 500 in May. That means he’s won three of the past four five-hundred mile races. Do the odds favor him? I think that the usual suspects will all be in contention for the win in the latter stages of the race. Remember, Pocono does not produce fluke winners. Chevy and Team Penske have been strong at Pocono, even when Honda had the better record at Indianapolis. Although Dixon has won at Pocono, I’m picking Josef Newgarden to win and make himself more of a factor in the championship. I just wish I was going to be there this year to see it. This entry was posted on August 17, 2018 at 4:04 am and is filed under IndyCar. You can follow any responses to this entry through the RSS 2.0 feed. You can leave a response, or trackback from your own site. Thanks for your unique perspective. This was a unique article. What acute facility, Pocono is. From all three sides, it is the right track for Indycar. They have never been obtuse with the series, treating it equilaterally. Even Pythagoras could not have said it better. Wish I was going this year too. My friends in upstate NY are toying with going Saturday, but weather (and flooding) may be a factor getting there. Weather here at Pocono looks good for tomorrow Saturday. Then in the 70’s and comfortable on Sunday. Weather should not be a factor. Arrived Pocono this afternoon traveling Interstate west 80 from Western Massachusetts.